The cat to cow stretch or pose is great for spinal flexibility and abdominal core strength. It involves of moving the spine from a rounded position (flexion) to an arched position (extension). You begin on you hands and knees with your shoulders above your wrists and hips above your knees with a neutral or straight spine. On inhalation you tilt your pelvis back so that your sacrum which is more commonly known as the tailbone sticks up. Your belly drops down and your eyes comfortably gaze up toward the ceiling. 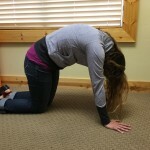 On exhalation you tilt your pelvis forward so that your sacrum tucks down toward the ground. Your spine will naturally round while you contract you core muscles and drop you head. For those that have trouble getting on their hands and knees or would like to be able to perform this stretch at work this can also be done sitting. Could your spine use some love? Contact our practice today to book an appointment.